Samsung has stated that the available colours will be Charcoal Black and Frost White. Spec include a 5.7 inch Quad HD 2560x1440p display, 2.7GHz Snapdragon 805 processor, 3GB of RAM, 32GB of internal storage which can be supplimented by 128GB via microSD card, 16MP Camera with Optical Image Stabilization. Carriers include Rogers, Bell, TELUS, Koodo, WIND Mobile, Videotron and SaskTel with more to be added later. Check out the full press release after the break. 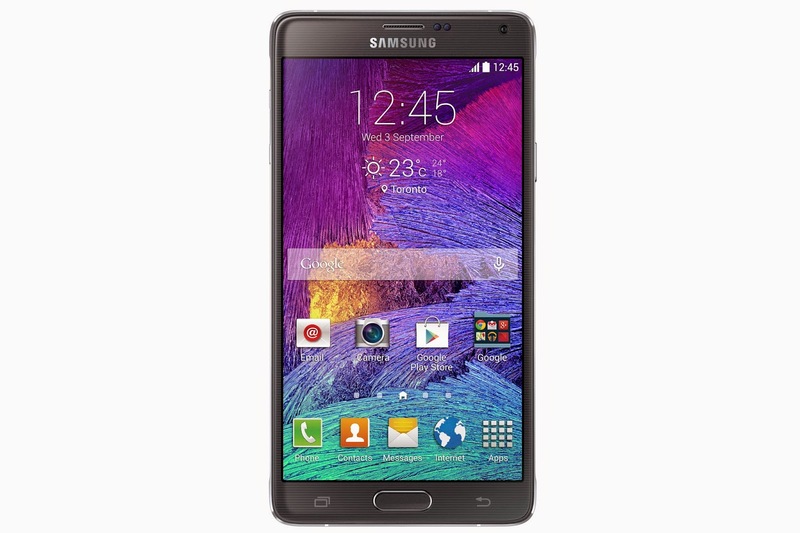 MISSISSUGA, ON, Oct. 14, 2014 /CNW/ - Samsung Canada, one of the leading suppliers of smartphones to Canadians and category creator of the Note series, announced today that its most powerful and innovative device to date, the GALAXY Note 4, will be available to Canadians beginning October 24th. Featuring a superior viewing experience and powerful camera functionality, the GALAXY Note 4 provides users with one of the most unique, enjoyable and productive mobile experiences on the market. The device also adds something special to consumers' smartphone experience with its evolved S Pen™. Now Canadians can use the S Pen™ to add emotion, humour, clarity and style to their everyday tasks. "Samsung Electronics pioneered the large-screen smartphone category through the introduction of the GALAXY Note series in 2011, and we remain the industry leader in this category," said Paul Brannen, Executive Vice President, Mobile Solutions, Samsung Canada. "The new GALAXY Note 4 introduces the most refined Note experience to-date by featuring innovative technology including the enhanced S Pen™ which allows Canadians to add more of themselves to their mobile experience." Representing the fourth generation of Samsung Canada's renowned Note lineup, the GALAXY Note 4 features a brilliant screen, advanced photo technology for both front and rear cameras, battery and charging improvements, as well as S Pen™ advancements. The extraordinary 5.7-inch Quad HD (2560 x 1440) Super AMOLED® display creates a stunning viewing experience while the metal frame and soft textured body give the device a premium, stylish look and feel. Add emotion with the S Pen™: With the reimagined S Pen™ featuring 2,048 touch pressure points, writing is more natural, allowing users to easily handwrite e-mails and texts, capture and edit meeting notes as well as add handwritten messages to their photos. Improvements to the S Pen™ mean it works with comfort and precision that is now akin to a computer mouse, making it easier to select and move information, resize windows, and drag and drop between different apps. Add clarity to your content: Samsung continues to refine the S Pen™ experience with a more user-friendly Air Command functionality along with other intuitive features such as Action Memo, Screen Write, Image Clip and Smart Select allowing you to create and collect content. Add your own style: The GALAXY Note 4 offers multiple, seamless note-taking methods integrated with the S Note application. In addition to typing and writing, the innovative Snap Note feature allows you to take a picture of notes on a paper or a whiteboard, and then quickly and easily convert to an S Note. Do More than One Thing at Once: Due to its large screen, the refined Multi Window feature helps Canadians multi-task more efficiently by letting users choose how they access their applications with full, split or pop-up screens. Bigger Selfies for Bigger Moments: The GALAXY Note 4 is equipped with a 16 megapixel rear-facing camera featuring a Smart Optical Image Stabilizer that counter-balances camera shake and automatically extends exposure time in dark settings. In addition, a 3.7 megapixel front-facing camera with f1.9 offers a default 90 degree shooting angle and up to 120 degree wide angle so users can get more friends and fun in frame. Power-Up Fast and Stay Powered: Never miss that important call or text again. With the GALAXY Note 4's Fast Charging ability, you can recharge quicker than ever. In addition, the Ultra Power Saving Mode¹ helps to maximize battery life, even at 10% charge, you can still receive calls and texts for up to 24 hours. Keep the conversation going: Multiple microphones and an improved speaker phone for better noise cancellation when speaking in loud environments will help Canadians keep in touch. A built-in voice recorder offers eight different directional voice tags and a selective playback capability that allows users to isolate and listen to specific voices in a group conversation. Stay more protected: The Galaxy Note 4 also offers an improved Fingerprint Scanner to secure personal data and a UV sensor. Availability The Samsung GALAXY Note 4 will be available in Charcoal Black and Frost White through major Canadian carriers and retailers starting on October 24, 2014. Additionally, pre-orders have begun. Please see carriers for more details. ¹ Ultra Power Saving Mode: Battery life will vary depending on power, applications settings and other factors. The maximum capacity of the battery will decrease with time and use.